The 5.56mm M249 is an individually portable, gas operated, magazine or disintegrating metallic link-belt fed, light machine gun with fixed headspace, and quick change barrel feature. The M249 engages point targets out to 800 meters, firing the improved NATO standard 5.56mm cartridge. The M249SAW forms the basis of firepower for the fire team. The gunner has the option of using 30-round M16 magazines or linked ammunition from pre-loaded 200-round plastic magazines. The gunner's basic load is 600 rounds of linked ammunition. The new 5.56mm XM249 SAW was developed by Fabrique Nationale of Belgium and first unveiled in 1974. Known in Europe as the FN Minimi, its development took place well before the NATO 5.56mm Second Caliber Standardization Agreement (STANAG 4172) to assure commonality of ammunition. It was a calculated risk that has paid off handsomely for FN and once again thrusts the company into the forefront of military small-arms technology. Included in the type classification action of 1 February 1982 were the important new ammunition components of the SAW system. The M855 5.56mm ball cartridge uses the Belgian SS109 bullet which weighs 62 grains and contains a hardened-steel penetrator frontal core and lead base encased in a copper jacket. The bullet is green-tipped as this is the new NATO color code for this type of ammunition. This improved projectile requires a rifling twist of 1 turn in 7 inches to stabilize the bullet in flight, as opposed to the old M193 bullet which needs a twist of 1 turn in 12 inches. The new M856 5.56mm tracer cartridge uses the new longer L110 projectile which weighs 64 grains and encases the tracer element as well as the lead core in a gilded metal-clad steel jacket, allowing for an unprecedented 900-meter burn-out. This was a much criticized area in the past. 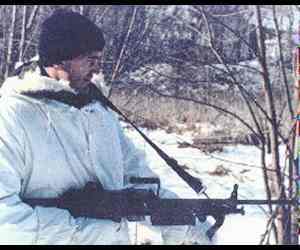 The SAW was developed through an initially, Army-led research and development effort, and eventually a Joint NDO program in the late 1970s/early 1980s, to restore sustained and accurate automatic weapons fire to the fire team and squad. When actually fielded in the mid-1980s, the SAW was issued as a one-for-one replacement for the designated "automatic rifle" (M16A1) in the Fire Team. In this regard, the SAW filled the void created by the retirement of the Browning Automatic Rifle (BAR) during the 1950s because interim automatic weapons (e.g. M-14E2/M16A1) had failed as viable "base of fire" weapons. Early in the SAW's fielding, the Army identified the need for a Product Improvement Program (PIP) to enhance the weapon. This effort resulted in a "PIP kit" which modifies the barrel, handguard, stock, pistol grip, buffer, and sights. On 1 February 1982 the M249 machine gun was officially adopted (type classified) by the United States Army with the approval of the U.S. Army Armament Research and Development Command (ARRADCOM) in Dover, N.J., and Aberdeen Proving Grounds, Md.